A fund that has an expense ratio of 1.10 charges 1.10% a year of the total assets you have in the fund. A fund that has an expense ratio of .20 charges .20% or 1/5th of 1% of the amount you have invested. Sometimes you will hear expense ratios stated in terms of "basis points". A basis point is equal to .01%. A fund that charge 30 basis points charges .30% or just under 1/3rd of a percent a year. Expense ratios are not deducted from your account or investment. Instead, they are deducted from the total assets of the mutual fund before you get your share. This means if the investments owned by the fund delivered a gross return of 10%, and the fund has an expense ratio of 1%, your return, net of fees, is 9%. According to the mutual fund research firm Morningstar, in 2015 the average U.S. equity fund charged .58%, the average international equity fund charged .77%%, and alternative funds charged 1.31% a year on average. Funds that own small companies and international investments will have higher expense ratios than funds that own large U.S. companies. It is because it takes more expertise and research to research and trade in smaller stocks and overseas investments. When comparing expense ratios, it is important to make sure you are comparing funds that own similar types of investments. It would not be fair to compare the expense ratio on an emerging markets fund to that of a U.S large cap fund. It would be fair to compare the expense ratio of one emerging markets fund to that of another emerging markets fund. You can always look up a fund’s expense ratio in the fund’s prospectus. It is mailed to you each year, although in some cases now it may be delivered to you electronically. You can download a fund’s prospectus from the mutual fund company’s website. Look in the table of contents for a section called “Fees and Expenses,” and it will tell you the expense ratio of your fund. Expense ratios have the effect of reducing the return on your investment. You have to look at investment returns net of fees and taxes to make a good comparison. Each mutual fund will have a defined investment objective and will either follow an active or passive investment philosophy. 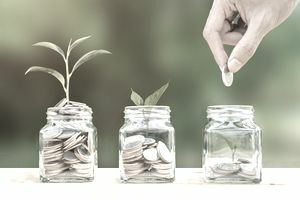 Active funds spend money on research and trading trying to pick the best set of investments within the category they focus on, and because of the extra work involved, they have higher expenses. Passive funds own a pre-determined selection of investments and have much lower expenses. Studies show that after accounting for fees and taxes, more often than not passive funds with lower fees outperform active funds with higher fees. Unknowingly, many investors pay too much for their investments. Paying attention to investment fees can increase your returns over time. For example, if you could find similar quality investments with expense ratios that were about .50% less than what you currently pay, on $100,000 that saves $500 a year. Over ten years, that adds up to $5,000 of savings.